While this might seem obvious have you ever actually seen a hair clog. Mostly in showers it turns into a clump, not so bad….yet. Now mix in dirt from your body, oils, shampoo, soap and any shower scrub leftovers and you have a rat. A super stinky, swear it could be breathing, slimy hunk of make you shiver nasty. How about the bathroom sink, just as hairy and slimy but add tooth paste and it turns that clog into cement. Fun times. 4.Sanitary napkins, other feminine hygiene products, diapers and those awful wipes. Again, obvious but totally fowl. Just don’t. Pulling these little beauties causes quite the stink. 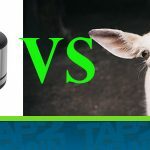 The stick part clings to the sides and the absorbent layers swell inside your pipes. Not to mention if you have a sump they love to clog the pump, then your alarm goes off and panic ensues. Diapers are the worst! Have you ever seen a toddler with droopy drawers? Now picture that in a pipe only meant to flush away waste. Oh and those wipes they might make you feel fresh and clean but your pipes pay the price. Oh the horror! Never ever flush any of these unless you want us to come for a visit. When your candle runs low and you really love the container DO NOT pour the leftover wax into your sink. It literally creates a plug. When our guys try to send the snake down your pipe all that happens is it punches a hole through the plug. 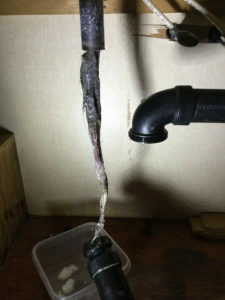 All that nasty wax clings to the sides of the pipe and no amount of hot water will remove it. Your nice guy tech must use specialty tools to remove the wax clinging to the sides. Mix wax with all the dreadful stuff that is already coating your kitchen drain like soap, cooking grease and small bits of food (we know you finger to mush it down, heck we all do) and then pull it out. It is truly putrid and hard as a rock. My stomach is turning just thinking about it. Blah! OK now here is where it gets seriously unpleasant. During one toilet clog call our technician found princesses covered in poop. Apparently, it was princess poops hot tub and sometimes the monster at the bottom of the tub would steal them away. We let the parents deal with that one. Round two of pretty gross, because drain lines accumulate sludge build up sometimes “things” don’t go all the way down. One drain cleaning call when the tech pulled the snake back through the corpse of poor goldy the gold fish came back too. I’ll just leave that visual with you and you can thank me I haven’t described the smell! This is by far the weirdest thing our techs have ever pulled out of drain line. I’ll let the story speak for it’s self. We received a call from a customer who said their sump pump was continuously running. 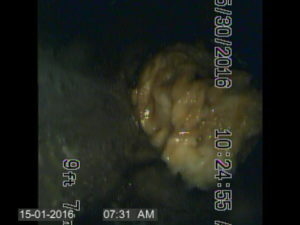 Upon inspection, it was found that the pump was trying to flush the fluids out the sewer line to their septic tank but there seemed to be a clog not allowing the effluence to be ejected. So, our tech breaks out the big guns and sends our power snake down the sewer line. Normally what happens once the snake breaks through the biggest part of the clog all the back up get sucked out in the right direction. This did not happen, when the tech pulled the line back out he saw something white among the debris. Thinking it was a toy or something he had a closer look, that’s when he panicked- it was teeth. All the things you’re thinking now are EXACTLY what he was thinking – WHO ARE THESE PEOPLE. First thing he thought he was going to have to call the police and have a full-on CSI episode happen. The home owners who had owned the home for 13 years had no idea. The tech retrieved the teeth and it turned out to be a set of dentures, again the home owners where stunned neither wore dentures or anyone they knew. Where the heck had they come from. In the end, no bodies had been flushed but the tech did find that the sewer pipe going from the house to the septic tank was held together with rags and had shifted causing the dentures to get caught up on the lip of the pipe. 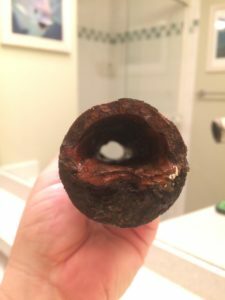 Over the years, the pipe had narrowed from build up until nothing would pass and bango our tech pulls teeth. We call him the dentist now. We fixed up their pipes as they turned out not to be serial killers but really nice people. Take a deep cleansing breath you survived! only highly trained on the latest drain clearing equipment and camera but have years of experience clearing all types of drain clogs. Just don’t. 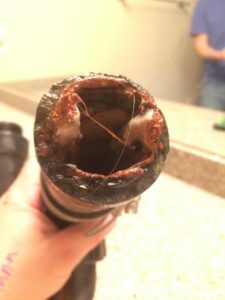 Don’t put anything down your drains that isn’t a liquid. Beyond the obvious that I will spare you from. But you get my drift. For sinks fill the bowls almost to the top and let it go at least once a month. The force of the water will help move some of the buildup along. 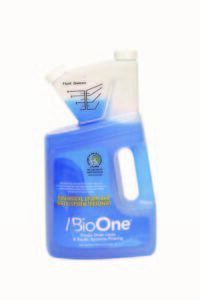 Use BioOne. Our exclusive natural enzyme that eats all the biological build up in your pipes but is safe. BioOne will not eat your chrome or cause you to pass out from noxious fumes. . 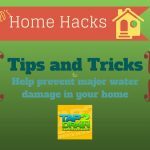 If you ever find your self in a clogged or slow draining situation give Tap 2 Drain a call 604-476-9104 – 24/7/365 we are the CLOG MASTERS! 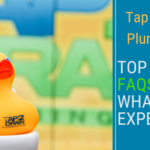 Along with Steve, Jen created Tap 2 Drain Plumbing to give clients exceptional service in their homes and businesses. Always ready to make you smile, Jen believes in building the business with integrity and is one of the driving force behind the scenes at Tap 2 Drain. "We treat clients the way we want to be treated, as family."